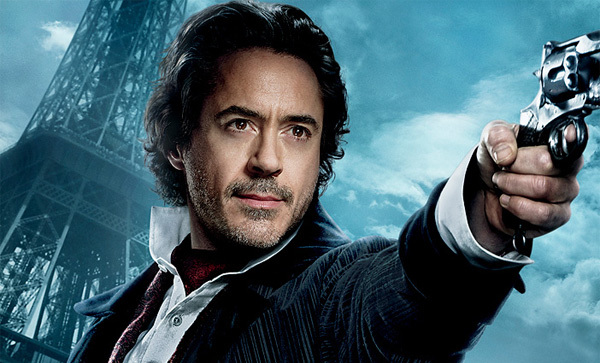 Holmes : Robert Downey Jr.
Set in 1891 and Europe was in turmoil. Sherlock, in disguise, follows Irene Adler and foils her latest plot, but they still have a date for dinner. Irene goes to talk to Professor Moriarty and he is not happy with her relationship with Holmes. He tells her he will no longer require her services. Om his wedding eve Watson comes over to see Holmes and Holmes tells Watson about the nefarious things that Moriarty is up to. It is a shadowey game that he and Moriarty are involved in. On the way over to a stag party Sherlock forgot to organize, they meet Mycroft and Sherlock tries talk Watson out of the marriage. Sherlock stops an assassin and Watson gets drunk and gets in a fight. Holmes and Watson show up at the wedding beat up and in tatters, but they show up, and Watson gets married. Holmes is asked to visit Moriarty at the college, and he does. Then on his honeymoon an assassin comes after Watson. Holmes shows up and to get Watson's wife to a safe place he shoves her off the train. Now it is Holmes and Watson again. More shannanagans follow as Holmes, Watson and a gypsy girl try to foil Moriarty's plan to start a European war so that he can make money selling them weapons. Lots of shooting, fighting and action. In his review Roger Ebert says: "It's Downey's movie. With his cool, flippant manner, his Holmes stands apart from the danger, thinking it through visually before performing it, remaining insouciant in the face of calamity. He appears in many disguises, one with a markedly bad wig, another as a remarkably convincing chair. The thing to do, I suppose, is to set aside your memories of the Conan Doyle stories, save them to savor on a night this winter and enjoy this movie as a high-caliber entertainment." I think Roger Ebert is right. This really isn't a Sherlock Holmes movie. Holmes, as in the preceding Ritchie movie, has almost super human powers as he can sense and foresee what his opponent will do. His mind works as a computer as it charts out his moves for him. Holmes instead of deducing things, pulls things out of his bag of tricks, Very different than the traditional Sherlock Holmes. Pretty good movie, but once again that was not really Sherlock Holmes. You can see in the IMDB description - Action - Adventure - Crime. What you don't see is the word Mystery. Well written, with witty dialogue and quips. But the attempt to "modernize" the Shelock Holmes character almost loses him completely.